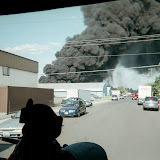 This afternoon, July 16, 2012 the Spokane Fire Department responded at approximately 5:47 PM to 523 East Bridgeport on a reported structure fire. Fire crews responding to this incident reported smoke showing from several blocks away. The first crew on-scene reported a garage at this location was fully involved with fire and fire spreading to a nearby duplex. Fire fighters aggressively attacked the fire within the duplex from the interior of the structure pulling the ceiling to gain access to the fire in the attic while the ladder crews completed search and rescue and vertical ventilation of the structure. Additional fire crews on scene extinguished the remaining fire in the garage. During the initial search of the structure fire crews found one occupant still inside the burning structure and he was safely removed. There were no reported injuries to civilians. One firefighter was transported to a local hospital and was treated and released for heat exhaustion. Nine fire companies with 23 firefighters responded to this fire and were on scene for approximately 3 hours. Fire damage was confined to the first floor and attic area with heat and smoke damage to the rest of the structure.